The Golden Circle | So Many Exciting and Beautiful Places! The Golden Circle covers about 200 miles, looping from Reykjavik into central Iceland and back. Our first stop was at Nesjavellir, a high temperature thermal area where it is easy to see dozens of steam vents. A geothermal power plant is located in this area. Pipelines send hot water to other areas in the country. We drove by one which was featured in the recent movie, “The Secret Life of Walter Mitty”. Because there is so much earthquake (mostly negligible) activity in Iceland, the pipeline has wheels attached, allowing it to move as needed. Thermal energy accounts for about 26% of energy production, and provides heat and hot water to 87% of the homes in Iceland. In addition, Icelanders are able to grow their own vegetables using geothermal heat for their greenhouses. Some restaurants even cook with the hot water that is so readily available. Our next stop was at Thingveller National Park, where the Althingi (Icelandic Parliament) was founded in 930 AD. Thingvellir is a UNESCO World Heritage Site, situated in an area where the tectonic plate boundaries of the North American and Eurasian Plates are spreading apart. We walked along the North Atlantic ridge, and crossed the rift valley toward the Eurasian ridge. We saw a lovely man-made waterfall, Oxarafoss. The creek and pools that come from the waterfall are littered with coins thrown in by tourists. From there we went to the Gullfoss (Golden Waterfalls) in the River Hvita (White River). This magnificent waterfall cascades over several levels, dropping about 105 feet in total. When we first viewed the falls, it appears that the water is flowing into a chasm in the cliff. As we continued to walk, we could see more of the levels and where the water flowed into the river. At one time, the government wanted to build a hydroelectric plant. This would have destroyed the falls, however, and the plan was abandoned. 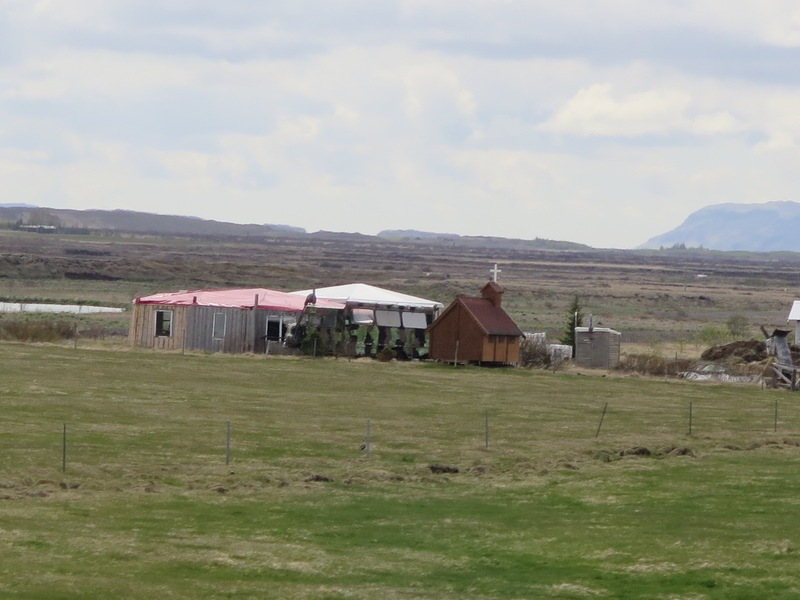 As we left Gullfoss, our tour guide pointed out what she called smallest church in Iceland. It’s on wheels and has been used in various locations for weddings or other religious services. From there we went to the valley of Haukadalur, where the famous Geysir is located. Although it is no longer active, Geysir gives its name to all other geysers. There is another geyser that does erupt on average every five minutes. It doesn’t last very long, so it was difficult to get good photos. There there was one, called Litli Geysir (little geyser) that just keeps bubbling away all of the time. Then we stopped at Skalholt Church, the ancient seat of the Icelandic Bishops. The current church is not the original, which was the largest church to have been built in Iceland. There was a full-scale model of a typical ancient church, with a sod roof, on the site as well. Our last stop was at the Nesjavallavirkjun, a geothermal power plant which began operating in 1990.The pipelines we had seen earlier are coming from this plant, and they run about 27 miles to the city of Reykjavik. This entry was posted in Iceland and tagged Geothermal Power, Geysir, Gullfoss, Skalholt Church, Thingvellir National Park. Bookmark the permalink. The tiny church is soooo cute ! !